Sixty-five-year-old Nan Powell has lived comfortably and happily in Nantucket since the suicide of her husband, Everett, so she is thrown for a loop when she learns that she is in danger of losing her beloved house. After weighing her options, Nan decides to turn her home into a bed-and-breakfast. The guests she gets for the summer are all at a crossroads in their lives in one way or another. Daniel has just separated from his wife and is facing something he has denied for years; Daff is recovering from the heartbreak of a divorce and getting a much-needed break from her anger-filled 13-year-old daughter; and Nan’s son Michael is on the run from a disastrous affair. Nan finds herself opening up to her guests and enjoying their company, but she is shocked when she discovers a person close to one of them has a startling connection to her. Peopled with likable, flawed, realistic characters and moving seamlessly between them. I loved this book! It was one of those perfect beach reads, no pun intended. I wasn't at the beach, but on my couch here in rainy Scotland. I had been eying this at the book store for weeks, and finally just grabbed it. I'm so glad I did. There were many stories in one. It's not just about 2 people, but of many all drawn and connected by this beach house. Makes me want to live in New England. Very enjoyable read! I'll be looking for more Jane Green novels! 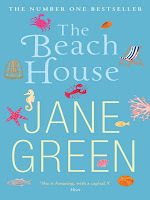 I adore Jane Green. I've only read a few of her early ones but they are certainly fun. Oh to be in raniy Scotland. Lucky girl. This sounds really very sweet. I hope to visit there in 2011. Ooh, I do live in New England, but would LOVE to live in Scotland. Want to trade for a week or two? I'm right on the coast! I would love to read this book, I am really into any books where a lot of unlikely people gather in one place. Makes for interesting stories! I tagged you on ABCs. Check out my blog for what to do!